Murchie’s is delightful, in case you ever get the chance to go into one of their shops. Small, quaint, and filled with things to delight any tea lover. I went in this autumn for the first time and bought two teas, Canadian Breakfast and Princess Blend (review coming soon!). I had a wonderful time, in part because of the great customer service that I experienced. They have a minimum order of 2oz of most teas, except from their “top shelf” teas where you can opt for only 1oz. The top shelf teas are, as one might expect, more expensive. Canadian Breakfast smells of maple and black teas. The ingredients are: Ceylon and Keemun black teas, maple flavouring. The packaging is simple but informative. 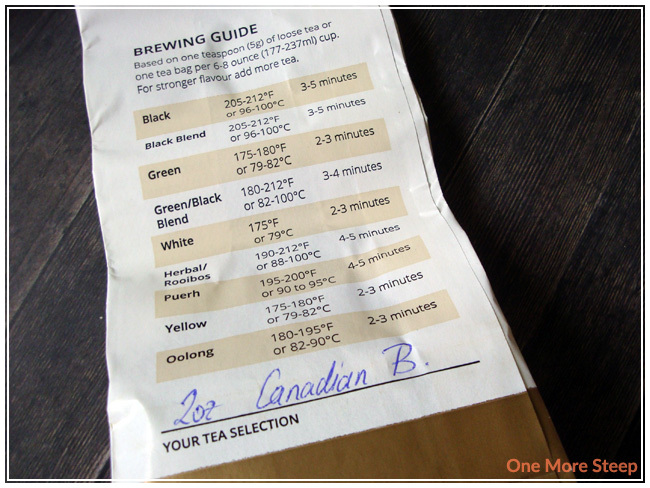 On the back (where the weight and name of tea is hand written) includes a general brewing guide. The two sides feature information (one side about brewing a good cup of tea, the other about Murchie’s the company). The front of the back boasts that Murchie’s uses “premium tea from select gardens around the world” and has a clear window so you can see your tea. It’s smells really good, and I like most maple things as much as the next Canadian. I like their packaging because it’s generic enough and informative enough that they can use it for all of their teas. I’m not a terribly big fan of the clear window and the fact that it’s not air tight (the big things that can ruin tea is: light, air, humidity, heat and odours – remember, if tea can take on aromas to flavour the tea, it can take on other smells as well! ), but it does the trick until time comes to transfer to a tea tin. 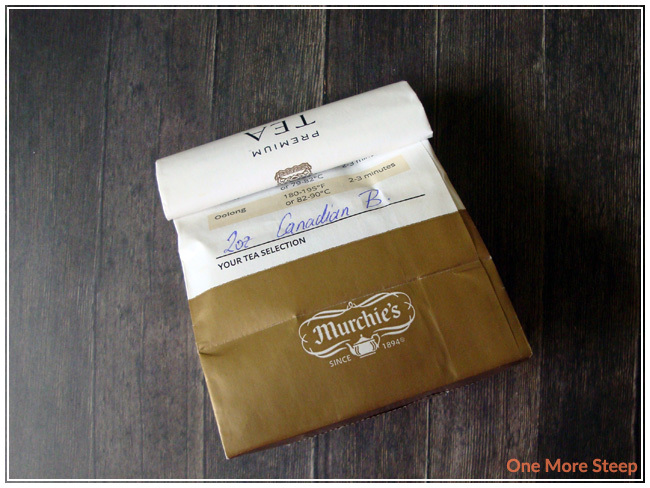 Murchie’s recommendation for their black teas is to steep in water that is 96-100°C (205-212°F) for 3 to 5 minutes. Canadian Breakfast is bright and bold in a way that is expected from a breakfast tea. The tea part of the breakfast tea packs an amazing amount of aroma and flavour when the tea is steeping. 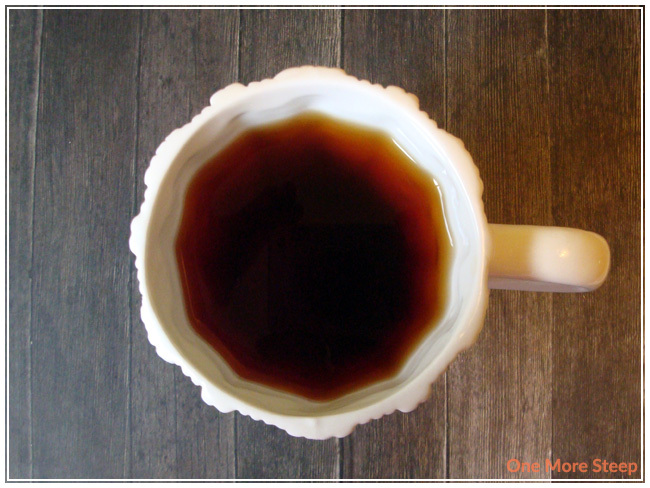 Canadian Breakfast steeps to a dark reddish brown, a colour that remind me of orange pekoe. 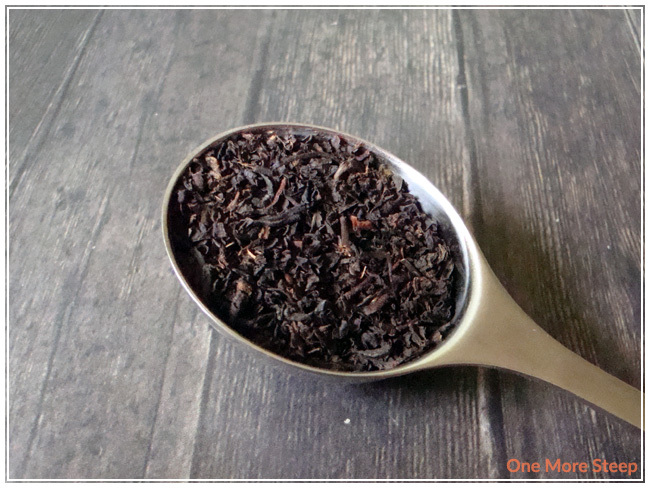 Most of the aroma of the steeped tea is the black tea blend, with a very subtle hint of maple. When tasting, the tea has a really bold flavour – the tea blend itself packs a bit of a punch with a flavour that reminds me a bit of grains and barley (malt flavours) with an astringent quality to it, and there’s the added sweetness of the maple that really brightens up the overall flavour. The maple isn’t very in-your-face once the tea has steeped, but it adds more flavour that makes the tea more complex than your average breakfast tea. Canadian Breakfast does wonderfully for a second cup. The maple flavouring is slightly less pronounced, as one would expect, but it does the trick. If you’re missing the sweetness of maple, a bit of sugar or honey helps bring out what maple flavouring is in your tea quite a bit to make cup #2 closer to cup #1. Canadian Breakfast doesn’t do that well for a third steeping. I liked Murchie’s Canadian Breakfast. It’s a really nice tea with bright, bold flavour with the sweetness of maple. I’m not generally one for breakfast teas (e.g. English or Irish), but I quite like Murchie’s Canadian version of a breakfast tea. For the price of the loose tea, it is decently priced. There are a lot more cheaper breakfast teas out there, but this one has an amazing quality about it that actually makes me like it – which puts its pricing solidly in the “worth it” category. I think as a tea, I’d drink it only after getting up when I’m looking for something to help wake me up rather than a tea that’s good for any time of day. If you’re looking for a breakfast tea that’s different from your usual English or Irish blends, I’d definitely recommend that you give Canadian Breakfast a try.